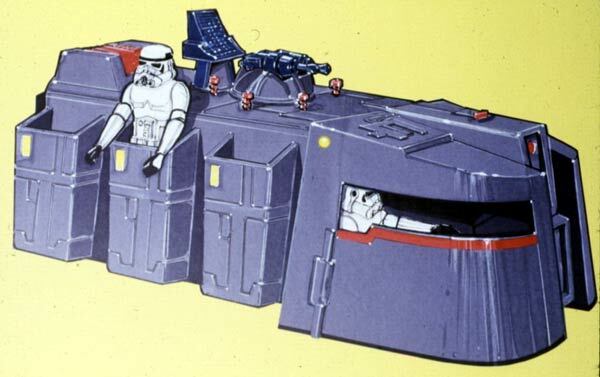 Here you see a piece of artwork that was used to help conceptualize one of Kenner's earlier Star Wars vehicles, the "talking" Imperial Troop Transporter. I can't think of much to say about it. But it's worth noting that it resembles the production toy to a high degree, meaning it was probably painted after the construction of the odd-looking conceptual model seen here, at a time when the design of the toy was finalized. Unfortunately, this item is not known to currently be in existence. The image you see of it comes from a batch of slides unearthed by Chris Fawcett, web master of 12back.com.